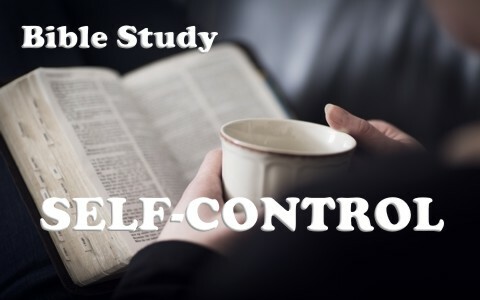 Here is a Bible study on self-control. Self-control has been defined as the ability to control one’s emotions and behavior in the face of temptations and impulses. That’s a very good definition but If it’s truly “self” control that the Christian is attempting to do, then we’re all in deep trouble because we can’t even come to Christ without God’s help (John 6:44). If I am depending on my own “self” in controlling the same, then I can never truly hope to live a holy life that is pleasing to God. We know it’s important enough for King Solomon to write, “A man without self-control is like a city broken into and left without walls” (Prov 25:28). In the case of a person with no self-control, it’s their sensual pleasures and gratifying the flesh that they only care about; even if it hurts others, not to mention, him. What does self-control mean to you? Is it harder for some than for others? Have you ever lost control of temper before? When the Apostle Paul was witnessing to Felix, Paul “reasoned about righteousness and self-control and the coming judgment, Felix was alarmed and said, “Go away for the present. When I get an opportunity I will summon you” (Acts 24:25). Felix must not have liked the necessity for believers to be exhibiting self-control. We shouldn’t make it harder for people to control their desires either as Paul wrote to married couples and said to “not deprive one another, except perhaps by agreement for a limited time, that you may devote yourselves to prayer; but then come together again, so that Satan may not tempt you because of your lack of self-control” (1st Cor 7:5) and if single can’t abstain from sexual immorality and “cannot exercise self-control, they should marry. For it is better to marry than to burn with passion” (1st Cor 7:9). Paul even instructs Timothy to have the older women teach the younger “that women should adorn themselves in respectable apparel, with modesty and self-control, not with braided hair and gold or pearls or costly attire” (1st Tim 2:9) and that they should “continue in faith and love and holiness, with self-control” (1st Tim 2:15) so obviously self-control is important for Christians. Why did Paul include self-control in his presentation of the gospel? Why does Paul mention marriage and self-control? Why is self-control important to single people? Self-control is not willing ourselves to be obedient and avoid sinful practices. We need a lot of help in fighting the three-fold enemy of the Devil, the world, and the flesh and we can’t do this by ourselves. We can only by Jesus’ strengthening us (Phil 4:13). We can’t do anything without Christ’s help and He even tells us, “apart from me you can do nothing” (John 15:5b) and nothing is not a little “something.” Paul, in listing some of the fruit of the Spirit, included “gentleness [and] self-control; against such things there is no law” (Gal 5:23) so this shows that our true source for self-control is not self…but God’s Spirit and as we have read, Jesus Christ’s own strength. Don’t you think God would honor the prayer request for self-control when we need it? Paul told Titus to “urge the younger men to be self-controlled” (Titus 2:6). So which is it? God’s Spirit and Christ’s strength or being commanded to have self-control. I believe it a bit of both but most of God. Paul wrote “it is God who works in you, both to will and to work for his good pleasure” (Phil 2:13) and since God’s working in us, we can’t just “let go and let God.” We must all strive to enter the narrow gate (Luke 13:24). Paul wrote, “I am sure of this, that he who began a good work in you will bring it to completion at the day of Jesus Christ” (Phil 1:6). Can we have self-control without God’s help? Do we contribute to the effort of having self-control? Why is self-control mentioned so often for the Christian? Thankfully, God gives us His Spirit to “equip you with everything good that you may do his will, working in us that which is pleasing in his sight, through Jesus Christ, to whom be glory forever and ever. Amen” (Heb 13:21). If you are yielded to God’s Spirit, abiding in His Word daily, being constant in prayer every day, and striving to live a life that is pleasing to God, then self-control should come much easier. I didn’t say it was easy…but it is easier with God’s help, God’s Word, God’s Spirit, Christ’s strength, and much prayer. We can do nothing for Him, apart from Him (John 15:5). I am a work in progress.. I too have far to go Marjorie. Previous post: How Does The Bible Define Agape Love? Next post: In What Ways Are Christians Called To Be Like Jesus?